Exceptional SMT Assembly lines, utilizing the latest technology in surface mount equipment. Altek Electronics’ state-of-the-art facility offers our customers flexibility with both Prototype PCB and Production requirements. We manufacture all circuit board assemblies in accordance with three classes of the Acceptability of Electronic Assemblies (IPC-A-610). Our SMT placement lines can produce either RoHS compliant lead-free assemblies or we can use traditional tin-lead solder in the printed board assembly process. Our circuit boards are assembled with exceptional quality, utilizing the latest technology in surface mount equipment. SMT component placement sizes range from 01005 to 2.2 inches enhanced by a placement accuracy of 15um at 3 Sigma. Circuitcam software creates machine programs from CAD data, reducing the risk of human error. Solder paste inspection equipment in-line to identify and eliminate paste defects at the earliest stage of your product run. 7 placement machines provide flexibility to run multiple jobs simultaneously, or use multiple machines to increase output on one large job. Two 3-D AOI machines allow us to verify the smallest components and provide for unprecedented quality control. Our Yxlon X-Ray machine inspects BGA placements to ensure proper alignment and reflow. Six Sigma Black Belts and Certified LEAN Leaders work to maintain quality, keep costs under control, and meet delivery schedules. An integral part of the Pick and Place Line for an efficient work flow. There are up to 10 zones in our hot air convection reflow oven’s closed loop process. Individual profiles allow us to control heating and cooling cycles to maintain uniformity, repeatability and exit temperatures. Your assembly is now ready to move to the next production process. Automated Optical Inspection is incorporated in our production line. 2D and 3D technology is available based on the board layout, component population and measurement of coplanarity on lifted leads and other height-sensitive devices. Our Process Engineers map out which option will provide the best results based on your board layout and population density. 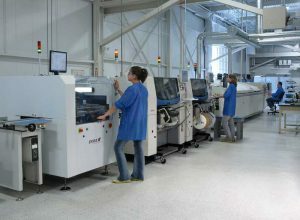 Producing assemblies that include BGA components can be challenging. Thermal expansion and mechanical stress can cause decreased reliability in your Assembly. Our X-Ray inspection system will identify deficient solder joints, moving the PCB assembly to a rework station before it goes any further in the production process.